Chances are you already have the necessary ingredients for the homemade ice melt that can free you from the big freeze this winter. Solid ice can bring your everyday life to a grinding halt, if you don’t have the means to get rid of it. Sure, you rely on shovels and picks to remove ice, but it’s a laborious process that can damage the underlying concrete or stone. And while ice melt works wonders, you’re out of luck if a storm catches you off-guard. The next time that happens, try homemade ice melt. Read on to learn three ways to make homemade ice melt with ingredients homeowners often keep on hand. Scattering handfuls of salt over an expanse of ice isn’t going to do you much good. To be effective as an ice melt, salt must permeate the ice, not rest on top of it. For that reason, it’s best to spread salt while pouring hot water over the ice. As the hot water melts the ice, the salt kicks in to prevent the liquid water from re-freezing. You can use ordinary table salt, but the best option is rock salt, which provides traction for shoes and tires. Note: The salt-and-hot-water method works to unstick tires, but do not use very hot water on a car windshield; the sudden temperature increase might cause the glass to crack. Also, bear in mind that high salt concentrations can be toxic to plants (though not as toxic as most store-bought ice melts). A common ingredient in commercial fertilizers, ammonium sulfate works by lowering the temperature at which ice melts. In other words, it doesn’t melt ice immediately, but it hastens the process. And unlike salt, it can be spread over the ice surface. Check your garage to see if you have any fertilizer left over from spring, and on the package label, confirm that ammonium sulfate is listed as a component. Note: While fertilizer may be safely used as a homemade ice melt for lawn and garden areas, it’s best not used on driveways, paths, or in any instance where the fertilizer, once it combines with liquid water, might land in the municipal sewer. Famously, fertilizer runoff is an environmental concern. At -20 degrees, rubbing alcohol has a much lower freezing point than water. For that reason, alcohol often appears as one of many ingredients commercial ice melts. But if you have rubbing alcohol in the home for sanitary purposes, you can harness its ice-melting potential in a couple of ways. First, you can simply pour the alcohol on any icy areas you wish to break up. Or you can combine the alcohol with water in a spray bottle, creating a longer-lasting and easily portable ice-melting solution. 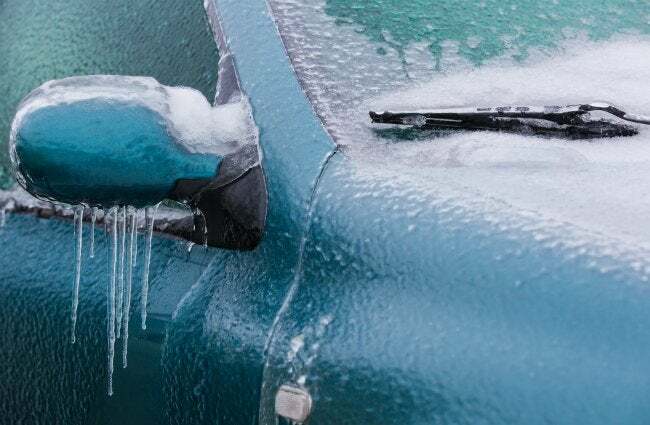 Keep it in your car and use it the next time your door gets stuck or your windshield gets frosted over. No matter your chosen homemade ice melt, it’s best to simultaneously lay down a substance that adds friction, at least to surfaces anybody might walk upon. Sand and salt—and kitty litter—all do the trick.